Despite being dominated by Asian businesses, official figures for 2017-18 suggest growing diversity in sources of investment and targeted sectors, with real estate, agriculture and services all on the rise. H.E U Phyo Min Thein, Chairman of the Yangon Region Investment Committee, spoke at the Yangon Investment Forum held on 9 May, 2018. Held on May 9 Yangon Investment Forum themed "Yangon Region: Investment Hub in Myanmar" aimed to focus on the significance of Yangon in terms of investment opportunities for both domestic and foreign investors. Organised by the Yangon Region Investment Committee (YRIC) and the Department of Investment and Company Administration (DICA), with the Myanmar Investors Development Association (MIDA) as the main sponsors, the forum provides a rare opportunity for investors to learn directly from regional authorities and the Myanmar Investment Commission. 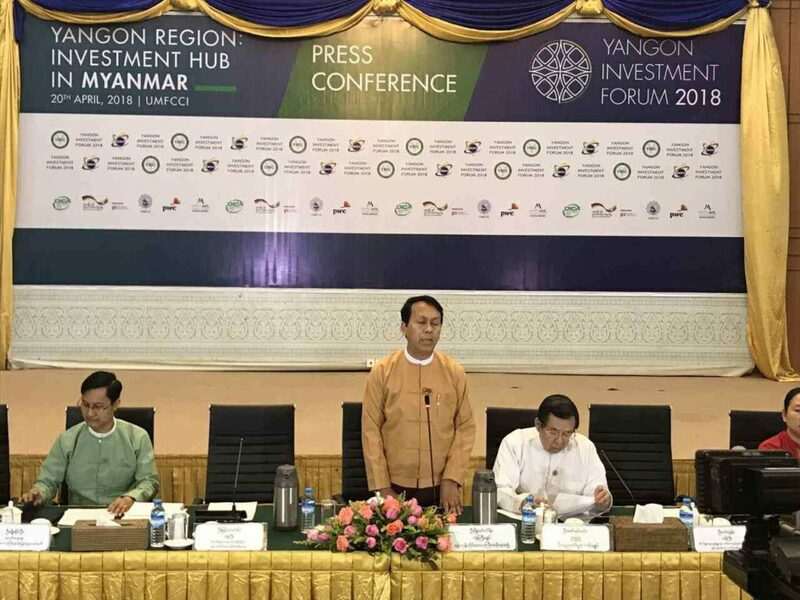 This year, the forum's aim was to promote the "economic epicentre" of Myanmar and in particular, Chief Minister U Phyo Min Thein's New Yangon City project being developed in Yangon's west. In contrast, China accounted for 30% of participants, while ASEAN countries comprised another 35%. The remaining attendees were also predominantly Asian with comprising India, Japan, and South Korea. leverage the scale of and potential infusion of technological, managerial, and marketing know-how stemming from such linkages. Prior to the event, Chief Miniter Thein indicated that the New Yangon City project had already attracted strong investor interested from China, South Korea and ASEAN. But the disparity between attendance representation reflects an underlying notion that Western investors are retreating from Myanmar, and those from Asia, specifically China, are becoming more prominent. On April 30, the New Yangon Development Company signed a framework agreement with China Communications Construction Company to prepare a detailed proposal for the provision of infrastructure work for phase one of the project, which is expected to cost around US$1.5 billion. In 2017-18, approved Chinese investments through Myanmar Investment Commission totalled $1.395 billion – its second-highest annual figure since 2011-12, and around one-quarter of the $5.718 billion total for the fiscal year. Hong Kong, Japan and South Korea all remained important sources of investment, accounting for several hundred million dollars each. Many companies choose to invest through Singapore, so disaggregating investments poses challenges. However, Singapore remains the largest single source of investment, with $2.164 billion, the lowest total since 2012-13. The World Bank’s latest Myanmar Economic Monitor (MEM), released on May 17, said that while foreign direct investment commitments had declined in 2017-18, actual inflows of investment had remained steady. Over the period the MEM showed investment flow in a range of diverse sectors, including manufacturing, real estate, and agriculture, while previously dominant sectors such as transport and communications, power, oil and gas showed less. Additionally, sources of investment continued to diversify; where Singapore accounted for half of all contracted FDI in 2015-16, it was only a quarter in 2017-18. The MEM reveals this was in part because of less incentive for Myanmar companies to channel investment through Singapore. 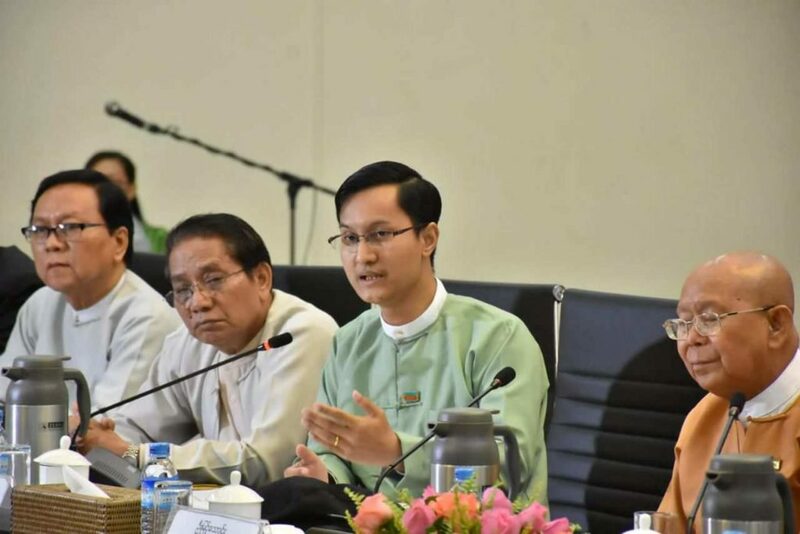 Daw Khine Khine Nwe, the secretary of the Myanmar Garment Manufacturers Association (MGMA), said investors from any country wanted predictability. The implication here is that without predictability, investors deem Myanmar a high-risk place to invest. To attract more investment, Khine Khine Nwe urged the government to place more emphasis on economic policy stability with a focus on long-term development. However, she said that Asian investors were more likely than their Western counterparts to invest in Myanmar for several reasons. One is that they can take advantage of Myanmar’s preferential trade status, such as the Generalised System of Preferences, which they might not have access to in their home country. In order to boost private investment, the MEM suggested the government continue with the implementation of the new investment and companies laws and associated regulations, while also making it easier to do business. Myanmar is currently ranked 171 out of 190 on the World Bank's ease of doing business rankings, and the government has set a goal to move into the top 100. Colliers identify that Myanmar's first step should be to further reform its trade and investment policies. Despite Tariffs being low, import and export licensing remain an impediment. The MEM suggested that reforms to meet this goal have the potential to boost private investment and support the economy to compete globally. While there has been recent progress, much remains to be done and it warned there were no quick fixes. However, to begin the process, the MEM recommended strengthening coordination across the government and improving communication in regard to recent economic reforms, monitoring progress on efforts to reform the business environment, and further liberalising regulations for foreign investment, including banking and insurance. Further to this, Colliers has said that reform will not only increase foreign investment inflow but also be central to diversification away from extractive industries. Reforms have also resulted in rapid tourism growth which has the ability to boost the economy enough to reduce poverty in the region.